No one who has read this blog for any length of time will be surprised that I was very excited to hear that a collection of Emily Dickinson’s bird-related poems was being released and a copy was on its way to me to review. * After all, I have already discussed on this blog what is perhaps her most popular bird poem, and I have been a fan of Emily Dickinson’s poetry since I was first introduced to it way back in high school. And the book, called A Spicing of Birds, has the added bonus of being illustrated by paintings and photographs by 19th century bird artists! Great poems, wonderful subject matter, gorgeous art…something has to go wrong, right? Fortunately, no. The book is superb through and through and I highly recommend it. To start with, A Spicing of Birds is beautiful from the White-throated Sparrow on the cover to the feel of the pages on one’s fingers. It is well-made and solid and the paintings and photographs look almost as if the originals were on the page. The title page, which features a screaming Blue Jay by Mark Catesby facing the opposite direction than it does in the original, is simply exquisite. I mean, come on, I noticed and mentioned the title page. That never happens. A book with a title page worth mentioning has a leg up on the competition before one even gets to the content! And the content, the content. A collection of Emily Dickinson’s work is always going to be appealing to me and that this collection is strictly about birds practically makes me swoon. 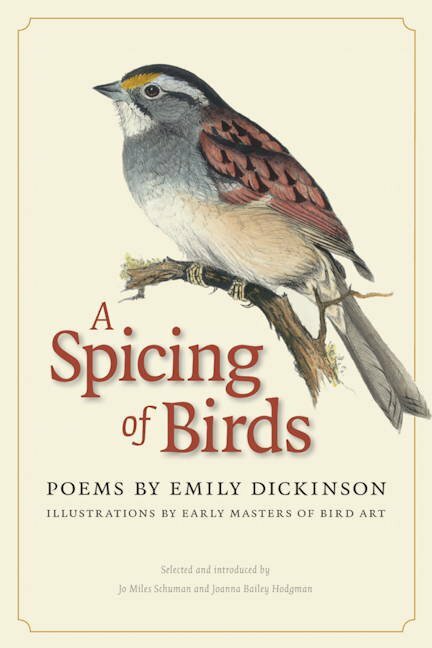 In the introduction, which, by the way, is written by what must be two marvelous women, Jo Miles Schuman and Joanna Bailey Hodgman, who also selected all of the poems for the book, it is mentioned that Dickinson references birds in 222 of her poems. If we round up her known works to 1,800 we find that over twelve percent of her poetry is in some way about birds. No wonder I think she is a wonderful poet! Even more impressive is her ability to capture not only the physical presence and character of a bird but also the impression a species makes upon humanity. Here, in full, is her poem about the (Eastern) Phoebe. The unassuming plumage and simple song of the phoebe ensure that it does not stand out, that it “makes a little print.” It would be wonderful to capture the character of a bird in a blog post as well as Dickinson does in eight short lines. Perhaps my favorite aspect of Dickinson’s bird poetry, however, is her ability to convey, in words, the essential quality of a bird’s song. And she does it best in her poem about a Song Sparrow at a cemetery. You won’t find a better description of a Song Sparrow‘s song anywhere. Not in field guides, not in birding magazines, not in the bird blog-o-sphere. First off, to say the bird “trilled, and quivered” captures almost exactly how the song sounds but using “shook his throat” is a stroke of genius not only because the image it forms is so clear but because the song of the Song Sparrow often sounds as if the bird is doing something mechanical to get the trémulo going. Then, in the second stanza, she describes how the bird “adjusted his little notes.” If you’ve listened to a Song Sparrow sing before you have noticed that each time it sings the song is slightly different in the detail while still being easily recognizable as the song of the Song Sparrow. So, once again, Dickinson nailed the description and with many less words than it would take me. Dickinson is so good at representing birds in her poems that she must have been a birder. She knew the birds’ appearances, voices, and habits better than many birders I have met. But the true evidence of her being a birder can be found, not in a poem describing a species, but in a poem about the seasons, specifically the stanza about spring. And the Bee be booming. She could not wait for the birds to be back on spring migration! Emily Dickinson, in addition to being an amazing poet, is a birder and we should claim her as one of the tribe. Go out and claim your copy of A Spicing of Birds. It is well worth the price and I highly recommend it (I even bought a copy for my mother for Christmas!). *Full disclosure: The only thing I received was a copy of the book to be reviewed from Wesleyan University Press. My attempts to get a free trip to a tropical paradise were rebuffed, as they always are. I love my copy. It’s a good thing that print doesn’t come off with repeated reading. Thanks Corey and Daisy! Thanks for the heads up — I just put it on my wishlist at Amazon. Why Not Allow Crane Hunting?